Institutions of higher learning are experimenting with new ways of teaching and learning and the North-West University (NWU) is no exception. 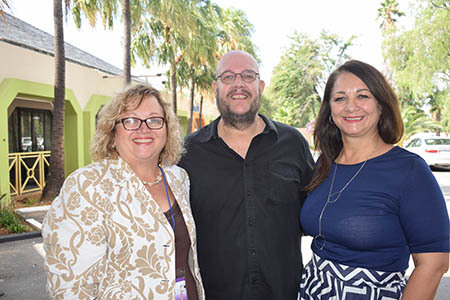 The Centre for Teaching and Learning (CTL) hosted an Extended Programme Indaba under the theme ‘Bridging the Gap’ with renowned author and public speaker, Rinus le Roux. Rinus says lecturers can achieve much more by getting students involved, showing appreciation and being able to adapt to different situations. The CTL’s Koos de Villiers and Naomi du Plessis say it is also important to learn from students, particular the Generation Z who have a new way of doing things. Lecturers also need to ask themselves how their teaching and learning accommodates the latter and what it means for curriculum development. In the meantime, Learning Circles – a highly interactive, task-based, participatory structure for organising group work – is being work-shopped across the NWU with great success. The NWU’s Centre for Teaching and Learning recently hosted an Extended Programme Indaba. Here are from the left Dr Annelize Cronje, Rinus le Roux, the keynote speaker, and Dr Miemsie de Jager.